Sewall Green Wright was born to Philip Green and Elizabeth Quincy Sewall Wright, residents of Melrose Massachusetts, on December 21, 1889. The family moved three years later after Philip accepted a teaching job at Lombard College, a Universalist college in Galesburg, Illinois. The ancestry of the Wright family could be traced through 16th century England to the 7th century reign of Charlemagne, and many of Sewall’s ancestors were distinguished educated and innovative individuals. Wright would later profess a great interest in heredity; in the example of his life, he certainly manifested the genes of past success. Wright and his brothers, Quincy and Theodore Paul, were very gifted children. Although they did not initially attend official schools, they were reading and writing at unusually early ages. Sewall entered the “publishing” arena at the age of seven with his pamphlet on various animals’ physical characteristics. Also, he was then able to extract cube roots, to the disgust of the other children. The atmosphere at the school was not conducive to learning, and Wright had to avoid participation for fear of sparking the ire of the other boys with his knowledge. Sewall during his student days at Lombard College. From his youth, Wright was fascinated with math and mathematical models. He would often waste afternoons playing with his mother’s balance in the kitchen, and she would in turn teach him arithmetical methods. The Wright parents were fond of reading to their children, and in the home a highly intellectual atmosphere was continually fostered. Wright, however, did not want to follow his father’s suggestions to study poetry; he instead was enthralled by nature. Wright attended Galesburg High School, graduating in 1906 to enroll in Lombard College to concentrate on mathematics and surveying. At the College, Sewall Wright’s interest in biology was spurred by Professor Wilhelmine Entemann Key, one of the first women to earn a Ph.D from the University of Chicago. This interest led Wright to study at Cold Spring Harbor during the summers of 1911 and 1912, after which he entered the University of Illinois for graduate work in biology. After graduating with a Master’s degree in 1912. he accepted an opportunity to work with Ernest William Castle of Harvard’s Bussey Institution. The research would concentrate on mammalian genetics, particularly as exhibited in guinea pigs. For his Ph.D, he investigated the inheritance of coat colors in the animals, received the degree in 1915, and went on to work on animal husbandry for the U.S. Department of Agriculture in Washington, D.C, where his task was to improve livestock. Wright suggested, producing via inbreeding to promote genetic dominance over fringe traits. “Systems of Matings,” published in 1921, was the culmination of mathematical work on selection and breeding. Eventually, he would continue this line of investigation in studying population demographics. 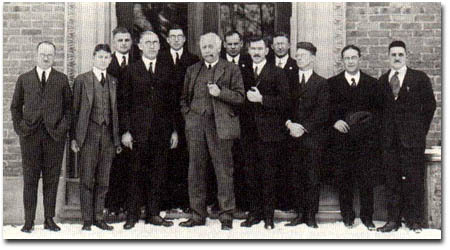 Wright (second from the left in front row) at Cornell University in 1922. Courtesy of the Archives of the Department of Plant Breeding at Cornell University. Wright decided to return to the work that he loved best, and joined the faculty of the University of Chicago to teach and research genetics. He embarked upon a distinguished career of publication at the university level, writing on genetics in populations and path analyses that could be applied to mathematical and social scientific models. Wright’s achievements in these areas were groundbreaking. As a statistician, Wright began work in 1917 with covariant analyses to determine the importance of various factors in defining traits. This expertise was extended into animal breeding. Mammalian genetics was one of his main interests. 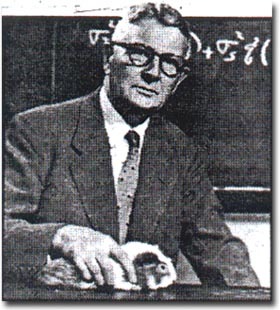 At the Bussey Institution, he was concerned with studies of rats, guinea pigs, and rabbits. Wright published on color inheritance in 1917 and 1918, the year in which he pioneered path analyses in his study of body characteristics in animals. On evolution, Sewall Wright was surely one of the most renowned researchers of the century. Wright developed a theory that attributed a substantial amount of genetic variance or “creativity” to small genetic fluctuations among small population groups. This was an innovative idea and caused the well-documented debate with the Englishman R.A. Fisher, who insisted that variance could be analyzed only in relation to large populations. Wright specialized in this field of population genetics while a professor at the University of Chicago. 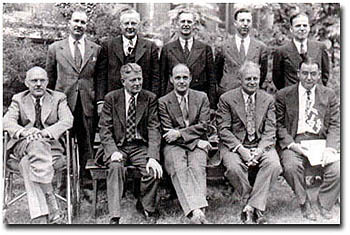 Department of Zoology faculty, circa 1945. Wright is the second from the left in the bottom row. One of Wright’s peculiar interests was in inbreeding, perhaps because his parents were in fact first cousins. His extensive guinea pig crosses were also notable. 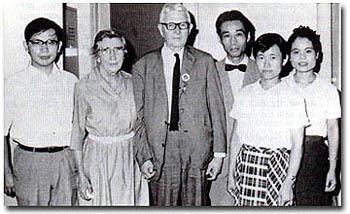 Maruyama, Louise Wright, Sewall Wright, Kimura, Ohta, and an unidentified woman at the Mishima Experimental Station at the time of the International Conference of Genetics in Japan in 1968. Sewall Wright married Louise Williams, a genetics teacher at Smith College, in 1921, and they had three children Elizabeth Rose, Richard, and Robert. He was a Unitarian, and attended church in Madison during the years when the minister was Max Gaebler. 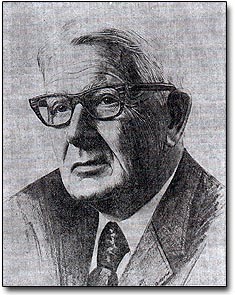 Sewall Wright died on March 3, 1988, at the age of 99, after a long and very productive life. — by Edric Lescouflair, a student of Sewall Wright. Sewall Wright’s untimely death occurred after complications from a fractured pelvis, the result of his slipping on an icy spot during one of his daily long walks. It may seem strange to regard a death in his 99th year as untimely, but not for Wright. He was eagerly looking forward to participating in this summer’s International Congress of Genetics in Toronto and enjoying banter about what to do in his second century. Only a few hours before his death he was discussing his most recent paper, wondering whether his reprints had arrived, signing a check for the coming month’s rent, and wondering how he could handle his income tax from the hospital. Yet in many ways a sudden death was a blessing. A long confining illness would have been very hard for one accustomed, as he was, to a high level of physical and mental activity. Walking and, when possible, swimming were very important to him, and he couldn’t read in a hospital bed. Wright’s death marks the end of an era. He had been for many years the sole survivor among those who established genetics as a solid science starting about 1915, a group that included Muller, Stadler, Sturtevant, Bridges, Fisher, and Haldane. With the latter two he founded the subject of population genetics and gave natural and artificial selection a quantitative basis. Sewall holding a baby raccoon at the Provine Farm in New York. Photo by Doris Marie Provine. Wright’s life and work are abundantly documented. There is a full-length biography, a reprinting of 42 of his 212 and several shorter articles. Provine has taped more than 120 hours of interviews and has preserved virtually all of Wright’s voluminous correspondence. There is also an oral history. Future historians will have a plethora of material. Because so much has been written about his professional life, and much more will be, I have elected to give a more personal account of this amazing man. Wright’s first paper was published in 1912 and his last in 1988, a span of 76 years. Wright’s four volume series was written in his late 70s and 80s. His last paper appeared in the January, 1988 issue of the American Naturalist. He retained his intellectual vigor until the end. Although his eyesight deteriorated badly, he learned to read with a machine that projected the printed page onto a television screen. He always liked history and biography, but only in his later years did he have the leisure to indulge this interest. In his last few weeks he read biographies of Jefferson, Tchaikovsky, Einstein, and the Kennedys and Fitzgeralds. And he could discuss them in detail. He was dissatisfied with the Einstein biography, and asked for a book with less personal life and more relativity. Philip Wright, Sewall’s father, was a polymath and was on the faculty of tiny Lombard College in Galesburg, Illinois. He taught mathematics, astronomy, surveying, economics, physical education, and English composition. He loved poetry and music and was disappointed that Sewall did not take to them. He had a printing press on which he printed his poems, as well as the College bulletins. Sewall and his brothers, Quincy and Theodore, printed the first poems of Carl Sandburg, who was a student in their father’s composition class. Philip Wright later moved to Harvard and the Brookings Institution where he published a number of books on economics. One of them, The Tariff on Animal and Vegetable Oils, included an appendix by Sewall; Quincy went on to become a distinguished scholar in the field of international law, while Theodore was chief engineer at Curtis-Wright, a Civil Aeronautics commissioner, and acting president of Cornell University. He is said to have turned down the presidency because he didn’t like raising money. Sewall Wright was born December 21, 1889, in Melrose, Massachusetts, but grew up in Galesburg, Illinois, where he attended Lombard College. He learned about the subject of genetics by reading Punnett’s account of Mendelism in the Encyclopedia Brittanica. 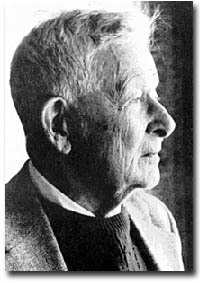 Although biologists regard Wright as a formidable mathematician, he never took any advanced courses; his math, beyond what he learned from his father, was self-taught. A photo-sketch of Wright by Edward Schumann. Between his third and fourth years of college, he made use of his surveying and mathematical skills by working with a crew surveying for a railroad line in the Standing Rock Reservation in South Dakota. It was an exciting time for him, in the Old West tradition with cowboys, Indians, mule skinners and outlaws; and he loved to tell about it. Late in the year he developed a lung infection and had to stay in a caboose. He was not too ill, however, to climb on the roof to see Halley’s comet. While confined to the caboose, he read Tait’s (1890) book on Quaternions. After his death I found what must be the same book, with many of the problems checked, these presumably being the ones that he had worked. It appears that he got about half way through the book. Curiously, J. B. S. Haldane also read Tait’s book on Quaternions under strikingly similar circumstances—while recovering from wounds in World War I. As far as I know, neither of them made use of this technique in his later work. One consequence of Wright’s lung infection was that he was refused life insurance by New England Mutual, something he found increasingly amusing as his age advanced far beyond the usual life expectancy. Upon graduation from Lombard, he received a fellowship at the University of Illinois. During this year William Castle visited the campus and, after an interview with Wright, hired him on the spot as an assistant. Wright’s Ph.D. from Harvard came in 1915. His thesis was on coat colors in guinea pigs, but he also worked out ways to measure inbreeding during this time. From 1915 to 1925 he was senior animal husbandman in the United States Department of Agriculture. During this period he did his classical studies on inbreeding and factor interaction in guinea pigs, the analysis of livestock breeds, and the method of path analysis. The last was a novel method for interpreting correlations in complex causal systems. His original paper on path analysis, “Correlation and Causation,” was rejected by the Bureau of Animal Industry, but was later published, thanks to the intercession of his colleague G. N. Collins, a leading maize geneticist. Wright also had trouble with the publication of his monumental analysis of corn and hog correlations. It was rejected by the officials in the Department of Agriculture on the grounds that an animal husbandman had no business writing about economics. Henry Wallace, later to become Vice President, eventually learned of the paper and, through the influence of his father, then Secretary of Agriculture, arranged for its publication. This may well have been the zenith of the Harding administration. 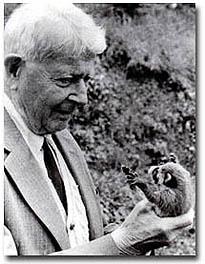 In 1926 Wright moved to the University of Chicago where he continued his guinea pig studies and wrote his influential papers on evolutionary theory. There he had several graduate students who went on to distinguished careers. Curiously, only one did a thesis in population genetics and none in mathematical theory; Wright’s emphasis at the time was on developmental and physiological genetics. At age 65 he retired from Chicago and was for 5 years Professor at the University of Wisconsin. Frugal Wisconsin never paid him a full salary, only a supplement to his Chicago retirement annuity. For this, the University got more than 30 years of Wright quality work—surely the best bargain Wisconsin ever had. An aspect of Wright’s life that is not fully appreciated was his great service to others. While at the United States Department of Agriculture he answered, fully and conscientiously, numerous letters from farmers and breeders. He had heavy teaching responsibilities at the University of Chicago, often two courses in the same term. His lectures were always carefully prepared, and he was in the labs himself. He was often called on to review manuscripts, difficult ones especially. He was one of the most frequent reviewers for Genetics. Many a published paper is better for Wright’s attention. Once, as an anonymous reviewer, he spent an enormous amount of time re-analyzing the data in a paper on mouse genetics, and reached the opposite conclusion. The author simply rewrote the conclusion. Wright’s reputation as a reviewer was so great that he was sometimes credited with reviews he didn’t write. Base camp. 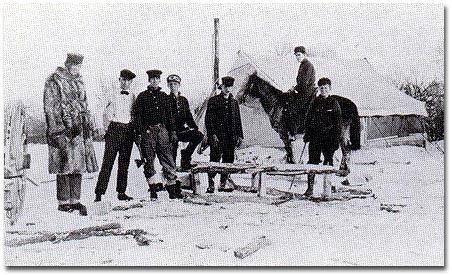 Wright is second from left. Wright was quiet, shy, introverted, and uneasy with small talk. He liked to talk, but only when there was substance. Conversations were often strained until the right button was pressed; then he was off on what was typically a long monologue. He liked to talk about his ancestors (for example, Judge Samuel Sewall, of Salem witchcraft fame), the connections between some of these ancestors and characters in Shakespeare’s historical plays, his childhood, his days on the railroad surveying crew, his travels, his guinea pigs, and, of course, his theory of evolution. All who heard him as a lecturer and teacher have vivid, affectionate memories of his crowding an enormous amount of factual information into a lecture; his talking and writing at breakneck speed; his note-cards, illegible to all but him; his covering the blackboard with symbols and his clothes with chalk, and erasing the board with any object at hand (although he denied the story of his using a guinea pig for this purpose); and, above all, his invariably running overtime. His wife Louise repeatedly reminded him to confine his lecture to the allotted time. He duly promised, but simply found it impossible to omit details. Wright has had an abundance of medals, prizes and awards, essentially all for which a population geneticist is eligible. He has had a number of honorary degrees although, as he liked to say, far fewer than Herbert Hoover. He has been president of the Genetics Society of America, the American Society of Zoologists, the Society of Naturalists, the Society for the Study of Evolution, and the Tenth International Congress of Genetics. To mention one more, he was the only geneticist ever to be elected a fellow of the Econometric Society. He method of path analysis, which uses correlations to analyze complex interrelationships in nonexperimental data, has recently become de rigueur in some social sciences. At Wright’s 90th birthday banquet a Wisconsin sociologist said that Wright’s contributions were such that the Sociology Department was prepared to offer him an assistant professorship. Wright married Louise Williams, who, in contrast to her husband, was an easy conversationalist and made friends readily. She especially liked to travel, and encouraged him to take long automobile trips which they both enjoyed. She died in 1975 leaving him very lonely, although this was not apparent; he was not one to share such feelings with others. My favorite anecdote epitomizes this modest, unselfish man with his self-deprecating wit that I want to repeat it. While writing his books he received a modest stipend from the National Science Foundation and during this time the Foundation offered to provide an inflationary adjustment to his pay. He was in his late 80s at the time. When I brought him this good news, he replied that, according to his careful calculations, his productivity was declining at exactly the same rate as the value of the dollar and he didn’t deserve any salary increase. He never accepted it. — By James F. Crow, a colleague of Sewall Wright. Abridged from Genetics 199, May 1988. Courtesy of the Genetics Society of America. Very few geneticists have written seriously about philosophy. Wright is an exception. He discovered that his Chicago colleague, Charles Hartshorne, shared a similar view about the philosophy of organism, and they became lifelong friends. Wright’s philosophical view has attracted some attention among philosophers, and he has several times been invited to participate in national and international conferences. It has not received any significant attention from biologists. Wright found it amusing that his views of the biological organism got more notice from philosophers than from his fellow biologists. His teacher, Wilhelmina Key, wrote him after receiving a reprint of his presidential address that at last he had written a paper that she could understand. — From “Sewall Wright, the Scientist and the Man,” Perspectives in Biology and Medicine, 25, 2 Winter 1982.